I have a confession...until I started seeing the word "ombre" on pinterest I didn't know there was a name for the graduated colour designs I was seeing. Shocking I know. 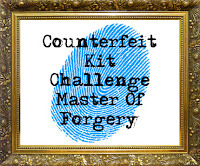 One of the challenges this month at Counterfeit Kit Challenge is to create a page using ombre. I decided to attempt an ombre background. 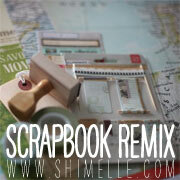 I took a sheet of resist cardstock from Stampin Up! and two shades of pink Glimmermist (Cherub Pink and Cranberry Zing). 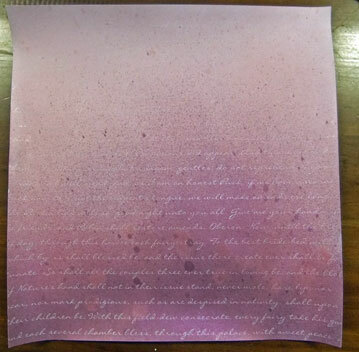 I sprayed away starting with a light spray of the Cherub Pink at the top of the page and building up to a darker pink at the bottom. As you can see it is not an exact graduated pattern with mist but you get the idea and I was quite happy with it. I especially like the resist print where the ink was darkest. Of course that much mist made all my corners curl up. Here is a shot of my layout in progress with various items from my desk holding down the corners. 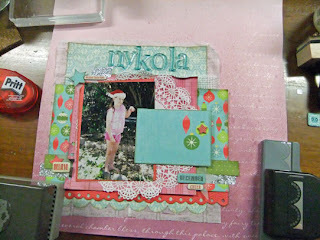 I am sure it will be fine once it is in a page protector ﻿in my album but it was a challenge to scrap on. Of course if I was patient I could have left it to flatten out under a few books but that wasn't going to happen. 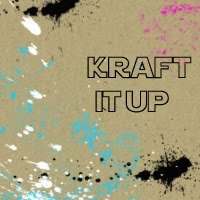 Once I had my idea I had to scrap....right then. I layered in lots of extra bits and pieces (mostly off my desk - really should clean up that desk) including a doily, some stars punched from vellum, some chipboard phrases from Echo Park, more lovely printed tissue and my title lettering which is from Heidi Grace (from about 2006 I think). Here is the completed layout (curly corners and all). I added in this cute striped paperclip (from K& Co's Smash Line). A closer look at the journalling. And one last peek at a few more of the layers. 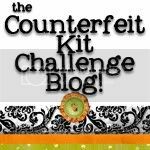 Hope you can join in the Third Challenge at Counterfeit Kit Challenge this month and try your hand at ombre. Beautiful page - that resist cardstock is perfect for this! oh this looks gorgeous - your bright kit papers are perfect for this and the use of the resist background is just lovely. What a super layout - really must try this technique. SUCH a great page!!! Love the way you used the technique. 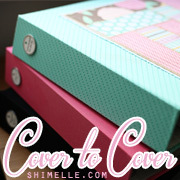 The colors are fabulous and...now I'm tempted to get out some of my mistable papers!!! Thanks for the inspiration! OH! It's beautiful Lisa! 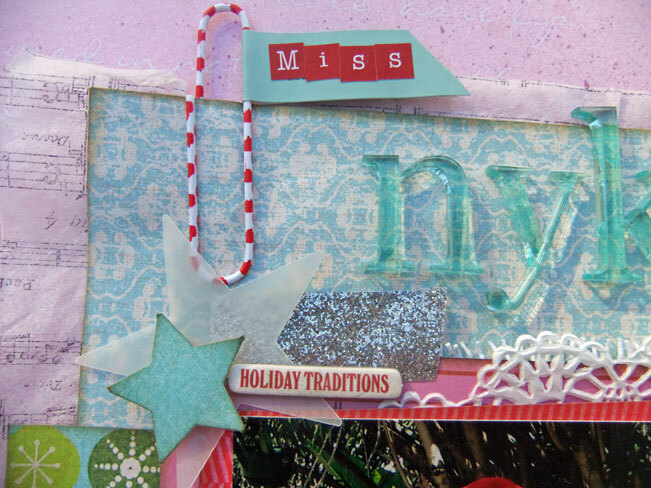 That red scalloped edge makes it "POP!" 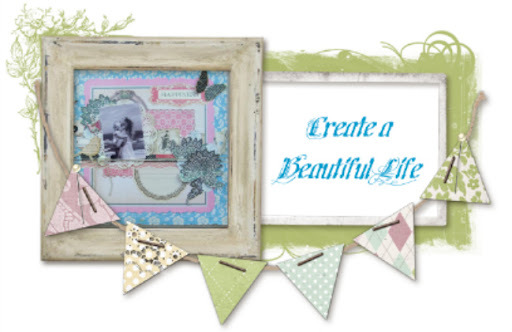 so well- not to mention the sweet little items on your journaling card! And... u have gorgeous printing. The pic is sweet, cracked me up, too! :) Fun job with the mist---- TYFS! Great LO. 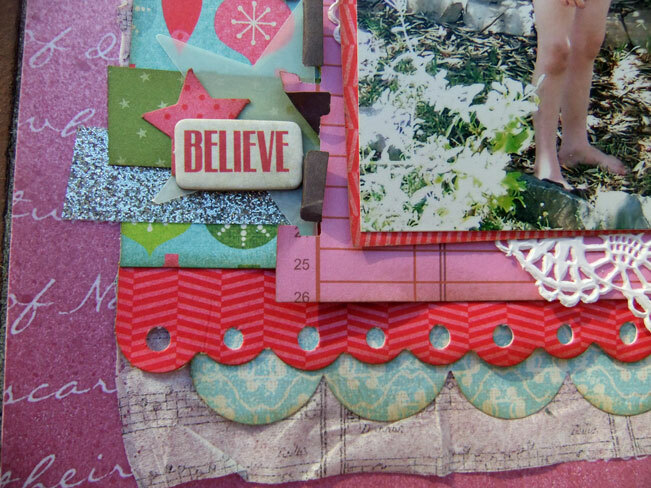 Oooh, I love that everyone has used a different medium for this challenge so far! Love the mist! Great layout! Love how your background paper came out! I've heard that if you iron it on the reverse side after its dry it will flatten back out. LoL!! I've never tried it though, I think it lays pretty flat once it goes into the page protector! Love your page - and the commentary! Your handwriting is SO need too. What's red, white and cuddly?